Is Agbon (Coconut) mistakenly referred to as Obi? Agbon is Coconut which is a tropical fruit from coconut tree. In comparison, a coconut tree is found around the house while a palm-tree is found in the woods. 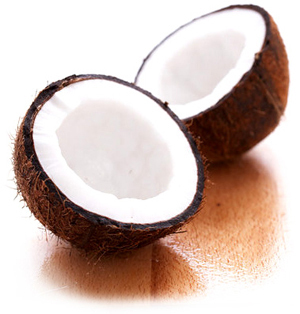 Coconut is covered with thick fibre and when this fiber is removed, there is a big hard nut which is cracked open as the display above. 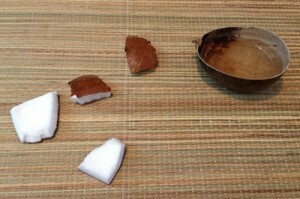 The edible fruit inside this shell is while as snow (see above – one part has honey, and the other part has cane syrup). If this is a mistake, please update your records to reflect same. Thank you. Thanks for your comment Adam. 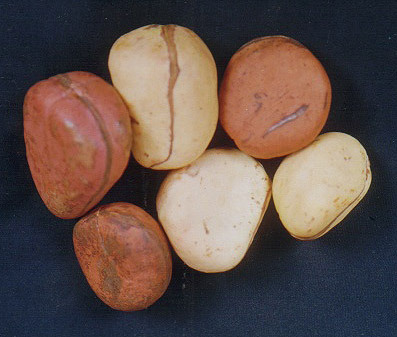 If you read the article you’ll see that under the section titled “The Evolution of Obi from Kola to Coconut” you’ll see how I explained that the proper word for coconut is indeed agbon, and that obí actually refers to kola nut, and how it changed over time due to the unavailability of kola nut in Cuba. Please read the entire article and you’ll see that point was already addressed and that there is no “correction” needed. Thank you so much for this website and sharing your wisdom. I have enjoyed reading each article, and I have learned so much. It is nice to see santeria explained clearly for those like me who don’t speak spanish fluently or come from Cuban/Puerto Rican heritage. The language and cultural differences have been ongoing barriers for me. I am especially grateful for your work with SAFE to help clean up the corruption and abuse that has been rampant in santeria for a long time. 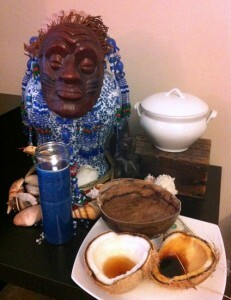 When talking to people about their experiences with santeria, it has been far more common to hear stories about being ripped off, abused, or traumatized rather than stories about being blessed or having a positive experience. I have jokingly said that the religion needs a massive spiritual enema! Thanks to people like you with pure and sincere hearts, it is happening slowly but surely. You are truly Olofie’s ashe in this world, without poor Obi’s arrogance. Thank you for being you. I googled Ochosi and this website came up……very interesting and informative. I had a dream with Ochosi, with the name written on an alter and many different faces and people in and out of some sort of santuary. The people where mostly older women with dresses and head wraps? Also, fish in the sea (beautifull fish). this website has taught me alot , although there is lots of info, I will continue to read until I get it.